Independence Day, aka the 4th of July, falls this year on a Wednesday. For some that means a Wednesday off work to enjoy a day of exploring outdoors! It also might mean that you find yourself with guests in town to entertain! – Beat the firework crowds with a Sunset Kayak in Santa Barbara Harbor. Enjoy a beautiful Independence Day sunset from the water before landing just in time to catch the 9pm Santa Barbara fireworks lighting up the sky. – Learn a new skill! Take a surf lesson at Santa Claus beach or stand up paddle lesson in the Santa Barbara harbor. – Celebrate independence with an exhilarating bike ride from the Mountains to the Shore. 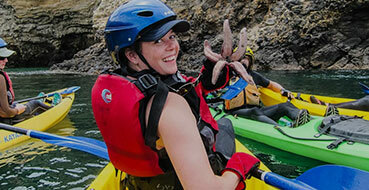 – Head out to the Channel Islands for a day trip to kayak the incredible sea caves. You’ll be back in time to catch dinner and enjoy fireworks in Ventura or Santa Barbara. You could also camp on Santa Cruz Island and catch multiple fireworks displays from the mainland. – Kick start your evening festivities with a bike tour through Santa Barbara’s Wine Country. Come explore the Santa Barbara wine region with a bike tour. Enjoy a picnic style lunch, wine tasting and a fun guide who will show you the way. This is one of our most popular summer tours, available most days during the Summer season. Call or check online 805-884-9283. – Catch the 54th Annual 4th of July Parade begins at 1:00 p.m. at Micheltorena Street, proceeding down State Street to Old Town Santa Barbara, concluding at Cota Street. Over 175 agencies will parade to a patriotic theme for the community to enjoy. This event is coordinated by the Pierre Claeyssens Veterans Foundation. Contact www.pcvf.org or (805) 259-4394 for more information. – Visit the Old Mission Santa Barbara (2201 Laguna Street) for a special 4th of July Art Show and view 80 incredible artisans for one of the largest and longest running art shows in California! Grab a bite to eat and enjoy the sights and sounds of this long running art show. Free parking and admission! 10 a.m. to 4 p.m.
– Hang out in Stearns Wharf and enjoy the Stearns Wharf Merchants Association Festival. Live music will start beginning at 12:00 p.m. and Santa Barbara’s fireworks show begins at 9 p.m. While waiting for the fireworks show to begin, the wharf offers many attractions including live music by Tequila Mockingbird and others along with face painting; ice cream, sherbet, candy, popcorn, fudge, and cotton candy; jewelry, hats, leather goods, art, crafts, gifts, toys, shells, mineral, and fossils; wine tasting; bait and tackle along with fishing gear rentals; palm reading; fresh fish, shellfish, steaks, prime rib, fish and chips, burgers, cocktails, exotic tropical drinks, and more! You can even enjoy a child-friendly water taxi ride and interactive Sea Centermuseum. There’s something for everyone! We wish everyone a happy and safe 4th of July.